Starting with the PlayStation 1 megahit, Final Fantasy VII, Square Enix has developed a habit of offering players a minigame or two to indulge in away from the main quest. These minigames actually play a really valuable role, and going back to the earlier games, which lack them, sometimes feels like a less rounded experience as a result. In giving players a reprieve from the endless cycle of combat and movement from one town or dungeon to the next, the developers have been able to deepen the sense of immersion that players have in the world by instilling a sense of normality to it all; the heroes play sports, have hobbies, and relax from their adventures, and that’s an invitation for us to take a break as well. Not all of the minigames work. Final Fantasy VII had the abominable snowboarding game (though at other times it had minigames that were really quite good, such as the chocobo racing). Final Fantasy XII’s minigames didn’t go much further than a running race thing that wasn’t entertaining in the slightest. But then many of the minigames were superb, too. 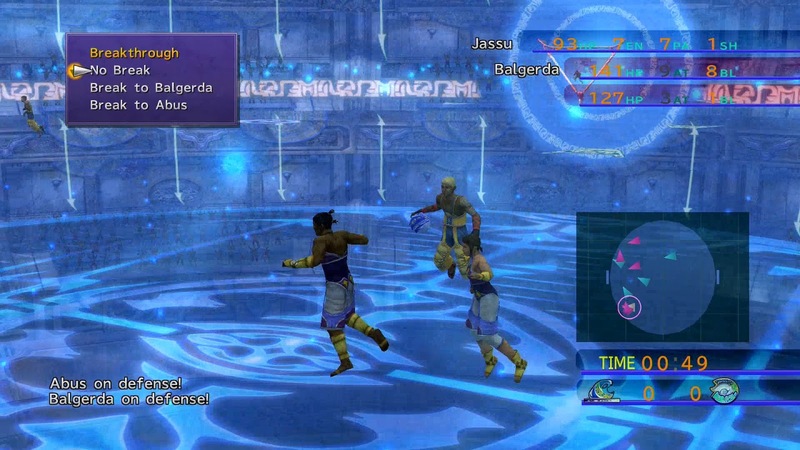 Blitzball in Final Fantasy X was, effectively, a turn based sports game that was so good that it deserves its own game. And then there’s Triple Triad. Final Fantasy VIII’s collectible card minigame was so ridiculously addictive that I would often find myself more interested in collecting cards and playing that game than moving through FFVIII’s actual quest. The underlying mechanics of the card game itself were relatively simple, but the way it was presented, as a “collect ‘em all” that had you travelling to the furthest flung parts of the world to try and track down the rare cards, made it so addictive. Now, with Final Fantasy XV, we have a really good fun minigame that riffs on pinball and mobile game design, called Justice Monsters Five (and, indeed, is available on mobile). Given we’re going through a lot of Final Fantasy stuff this week in the leadup to my review, I figured that I’d take a look at three of the finest minigames ever put into games, and how they benefitted the overall structure of the Final Fantasy titles that they were found in. As mentioned above, in Triple Triad you were tasked with travelling all over the world of Final Fantasy VIII to collect cards, which you would then use in battle against your opponents. Each game of Triple Triad took place on a 3 x 3 grid, split into nine squares. You and your opponent would each have five cards, and each card would have a number rating on each of its four edges. You’d take turns to put these cards down on the grid, and if a card had a higher number on its edge compared to the card next to it, that other card would flip control over to the side of the winner. The goal was to have dominated the game board with more cards on your side than your opponent had. Rare cards had better ratings on the edges, and while the strategy of Triple Triad was pretty simple (the person with the better cards was almost guaranteed a win), actually getting the good cards was a quest unto itself. 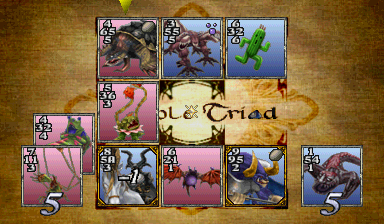 Oddly enough, unlike many other minigames in Final Fantasy, the rewards for doing well at Triple Triad never felt as integrated into the main quest. It was possible to pick up some items through it, but it was largely unnecessary to actually play Triple Triad. Its purpose was specifically for rest & relaxation, and given the generally serious tone to the game, this “downtime” was important for the game to avoid feeling too grim. Final Fantasy X had a turn-based sports game to get stuck into. Blitzball was an essential component of the game at one point, where the characters got into a game as part of the narrative. After that point, however, it was an entirely optional minigame through which you’d be recruiting new players to join the team, and then leading them to competition victory. In Blitzball, you’d have a menu of options to choose between for each action, not unlike in a JRPG combat sequence. Each character has their own special abilities and statistics, and after an action has been selected, there are a couple of seconds of action in real time as the effect of that decision is played out. Then the player with the ball will either be blocked by an opponent or be in range to take a shot, and there will be another menu pop-up with new decisions to make. Once again, it’s quite possible to play Final Fantasy X in its entirety without ever bothering with this minigame, but most players would get stuck right into it; not only is it a really good mix of JRPG and sports game (something we don’t see much of, this side of Inazuma Eleven), but it provides some light-hearted release from the heavy plot, thick with religious debate and tragedy. One of the Final Fantasy X characters (Wakka) says, early on, words to the effect that Blitzball gives people a chance to take their minds off the horrible things happening in the world; in that sense the gameplay purpose of this minigame runs parallel to its narrative function. The newest minigame in the Final Fantasy library, pinball/pachinko hybrid Justice Monsters Five, is so good that Square Enix decided to turn it into a dedicated mobile game. It’s a simple enough game. You’re in control of a projectile that slides back and forth across the bottom of the level. In the playfield above are monsters you need to defeat by flicking the projectile up towards them. Boss enemies have specific points of weakness that need to be targeted, and it’s possible to bounce the projectile off walls and ceilings, opening up the opportunity to set up rebound shots to do plenty of damage. The enemies, meanwhile, can attack back, meaning that you need to be both precise and strategic in how you go about tackling each board. What I really like about this minigame is the way it's integrated into the world of Final Fantasy XV. For a game that draws heavily on the road trip tradition, diners are vitally important settings. 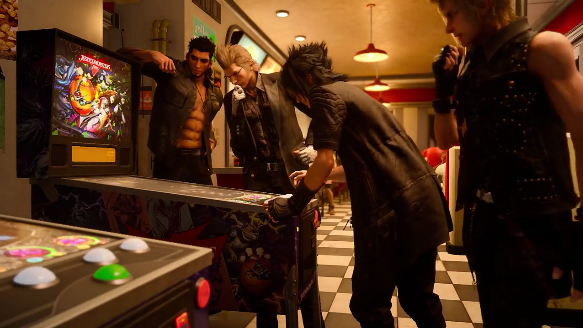 It would have been too easy for Square Enix to simply turn them into shops in this game, and in fact they do behave like shops; but at the same time, having something similar to the pinball games room that we saw in real diners back in the day really helps to set the scene and gives players a reason to interact with the aesthetics and function of a diner (as a rest stop), beyond its original simplistic function. The common thread here is, of course, that the minigames in Final Fantasy are designed to break up the action and give players a different way to interact with their characters and the world. Do they hold up as games in and of themselves? Not really, but they were never meant to, either. 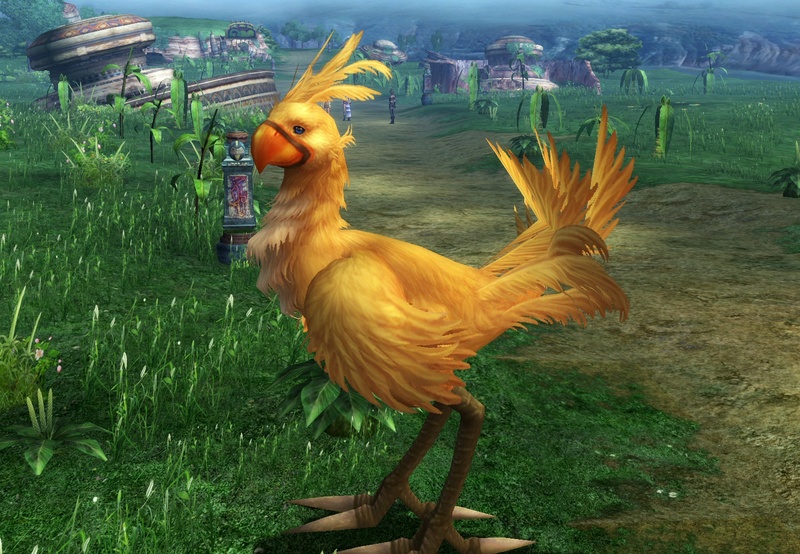 Without losing focus on the main narrative, as happens in many open world games that give players too much to do, the minigames in Final Fantasy can be seen as exercises in world building, and on balance they are especially good at that. Item Reviewed: On the minigames within the Final Fantasy series 9 out of 10 based on 10 ratings. 9 user reviews.